so an hour or so passes when the heat of the day comes down and grey murky clouds gather up in the sky. the runs are about to start and the weather matches our moods as our morning optimism slowly slides down and its back to anxiety. this time the bike is lighter as we got rid of the mudguard etc. we ensure that everything is in place and a trot around the place ensures that gears shift well. but thats no comfort as we all know what happened yesterday at high revvs. this time none of us are in a mood to suggest a mild launch like yesterdays, and the general opinion is to go for it and hope that gears shift. who knows, a miracle might happen. and there is lesson 7 for you dude - never include miracles in your plans. miracles are things that happen when you least think about, or expect, them. class begin as we catch some live action of the TVS shaolin bombing an RD or two. the bike is very quick off the lights and is normally off much before the other rider gets a chance to even react. 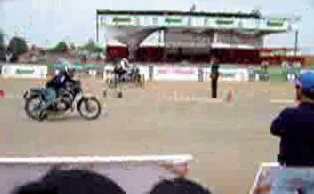 the TVS riders name is Ravindra and the RD guys do have a score to settle with him. one day i swear he will run into a good RD. but he is an awesome (and light) rider indeed, and just another good RD wont be enough. well soon its our run and tom prepares for another inevitable struggle with the gearbox. and yes i will cut a long story short and the run was yet another 3rd gear finish. the bike never shifted from 1st to 2nd under load and i can still remember the eerie soundtrack of a full blooded launch followed by a screaming struggle as the gearbox refuses to budge an inch out of 1st gear. it was almost as if somebody had dropped some rock into the gearbox. so despite having 2 more runs remaining, the mood is that of despair as the realization slowly sinks in that we have set out for something which we were so ill-prepared for. and that in spite of having a rock solid engine powerful enough to blow away most of the other bikes. the last point emerged clearly as the next run unfolded, and krisha landed up right next to a growling gixxxer. 12k redline, pushed ahead neatly. and that was one moment which got replayed a lot later on, because we got it on video. so even while the whole event remains as a dark failure in memory, this one run makes most of us smile. well the magic was certianly short lived as the RD went past the flailing gixxxer, redlined in 1st, and then our dear gearbox said no to any further gear shifts. as the RD struggled to get into 2nd, the gixxxer managed to land its front wheel, the guy got a grip on himself, and cleanly made it way past the 2stroke and disappeared into the distance. of course make no mistake - no way an RD is gonna take a gixxxer, so its not that the RD would have gone ahead and beat the gixxer to the finish had the gears shifted, no. but it would certianly have been an even better video where we could have seen the old 2stroke take the fight to at least the half line or maybe more. but in the end the 150 odd bhp of the gixxxer would have just swept away the RD at some point, so easily. so while that brought cheers to some faces, we still faced the reality of a single run remaining and a stubborn gearbox to cope with. i still remember how me and killer trudged our way to the finish line, carrying a beer and the speedgun. tom would be coming in a few minutes and we wanted to check the finishing speed. killer seems to expect a miracle and says so, tom will pull it off. but im not at all hopeful, cos the gearbox seemed so improbable to shift. but as i take a swig from the bottle and sit down for the next run, i admit to myself that even i have a small hope. perhaps some imperfection, or perfection, or whatever in some cog or dog or wheel or whatever somewhere in that old gearbox, something might align up just right so that it decides to shift that one time. heck no, soon i see one RD roaring up the other lane and there is not yet any sign of anything coming on our side. 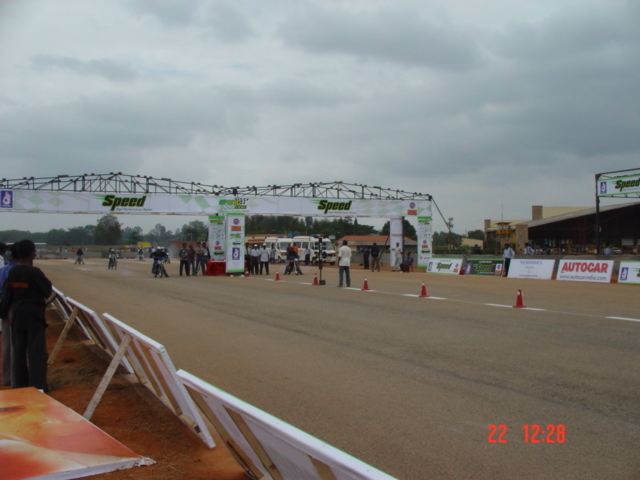 as the bike flashes past the finish, we begin to hear the struggle of an RD coming up the track and soon we spot our bike limping towards the finish at 80kmph in 2nd gear or so. so thats it, thats the end of our runs, thats the end of this drag for us, and thats the end of the season probably. 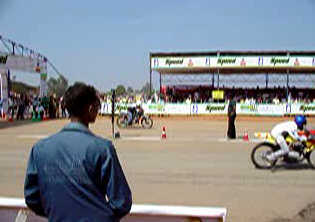 as i make my towards the start, i finish off the beer bottle and soon see the rest of the gang, all glum faced standing in the pits. of course they had been watching the launch and saw the gearbox messing up once again. so here we come to the end of stage 4 and our first attempt at drag racing. not much to cheer about, except that 140kmph run despite one lousy gearbox and a loose seat, and a "close" encounter with an unsuspecting gixxxer. but we havent quit, and we have plans.